There are 2-3 zones and then there is the Syracuse 2-3 Zone. Coach Jim Boeheim and his Syracuse Orange have been befuddling opponents for decades with their brand of zone defense. Syracuse recruits great players blessed with the length and athleticism to be effective in the zone, but aside from that, the forward play is what sets the Syracuse brand of 2-3 Zone apart. 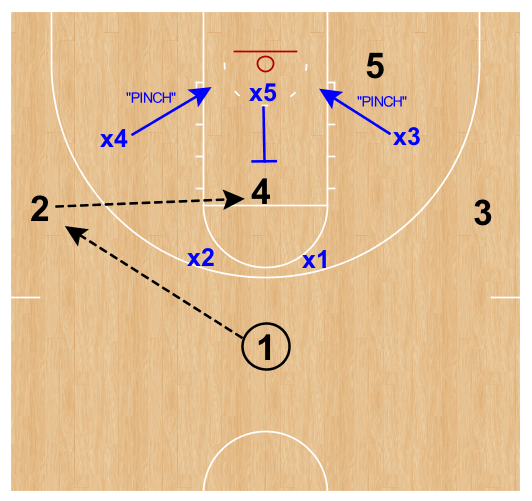 Instead of packing in the back line of the zone and letting the top guards run themselves ragged, Syracuse gets great activity from their forwards. As the picture below depicts, they do not have a “back line” as much as they have a “middle line” with the forwards setting up higher up the floor than the center. The forwards main responsibility is to take away wing three-point attempts. Not to contest them. Not to block them, but to keep them from even being attempted. In the photo above you see the Syracuse 2-3 Zone setup. Duke is in an odd-front alignment typical of most zone offenses Syracuse faces. As the ball begins to move, the forwards creep up the floor to get to the wings to contain the ball and take away three-point attempts. The guards and the forwards must work together to neutralize the three-guard front. The forwards help the guards by “bumping” at the wings. Teams may move the ball faster than the two guards can keep up with. Quick ball movement and skip passes necessitate some help from the forwards. A rule the forwards follow: if someone above you is open, take them. But take them only momentarily. Above you see the forward “bumping” with the guard at the wing. The forward closes out the wing. Syracuse forwards always close out with outside hand and foot up so as not to get beat baseline. If the wing drives it on the catch, they want to force the drive into the guard’s chest. The forwards stop the three, the guards stop the drive! The diagram below depicts the “bump” action. The forward takes the ball on the reversal just long enough to get “bumped off” by the guard. After being bumped off, the forward does not retreat to the block. He/she bumps down with arms out while facing the ball to block any passing window to the deep or short corner. Many teams use a high post against the 2-3 Zone. That soft spot in the interior of the zone is inviting. The forwards play no role in defending the high post. But they do play a vital role when the ball is entered to the high post. Another rule the forwards must follow: when the ball is entered to the high post “pinch” hard to the blocks. By pinching, the forwards close any passing windows for the high-low pass to the player behind the zone. In the diagram above, the center takes the high post and both forwards must assume there is someone lurking behind the zone and pinch to the blocks. The forwards cannot stand in “no man’s land” between the lane line and three point line. Doing so would leave a passing window to the player behind the zone. Syracuse collects steals by pinching. Often the high post sees the player behind the zone in the passing window and passes the ball only to have it swiped away midair by the pinching forward. 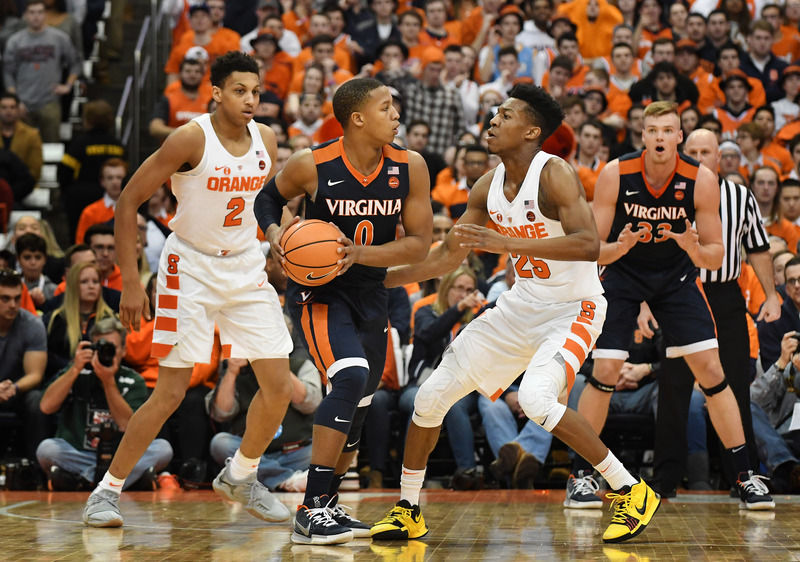 With the way the Orange use the forwards to take away wing threes, teams will often look to play the ball to short corner. But teams should do this at their own peril, for the short corner entry spawns an aggressive trap with the center and the forward. The backside forward rotates to the threat at the block and this leads to many turnovers for Syracuse opponents. A tight, aggressive trap takes away the vision of the ball handler (Player 4 above) and the Orange rotate to take away the next two most obvious outlets. The selective trapping such as the short corner trap is a way to force tempo and create steal with the zone. The trap isolates the ball from its teammates and rotating to the next two most obvious outlets terminates those players’ roles in the zone offense. 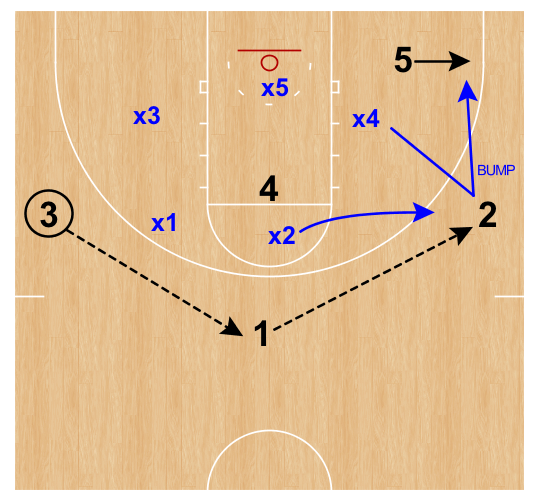 In the Syracuse zone the guards do not do all the work while the forwards lazily hang around in no man’s land. The forwards must be active with their feet, hands and mouths. They play the primary role in taking away wing three-point attempts off quick ball movement and skips. The forwards cannot be so concerned with players behind them that they are tentative to close out hard and long taking away wing threes. Remember, Syracuse does not play this zone because their opponents cannot make threes. They play this zone because their opponents can make threes. The forwards play a vital role in erasing those attempts from the shot chart. Check out #23ZoneTips on Twitter for more on these principles. For help with practice planning and implementation of these and other defensive elements please contact us and/or join our community for basketball coaches! Excellent reference/teaching points with 2-3.